Will Standard Processes Soon Be Extinct? Resolved Will Standard Processes Soon Be Extinct? With the kind of customization that clients want, standard processes just do not hack it in today's world where attracting and keeping clients happy is the goal. So are standard processes going extinct? 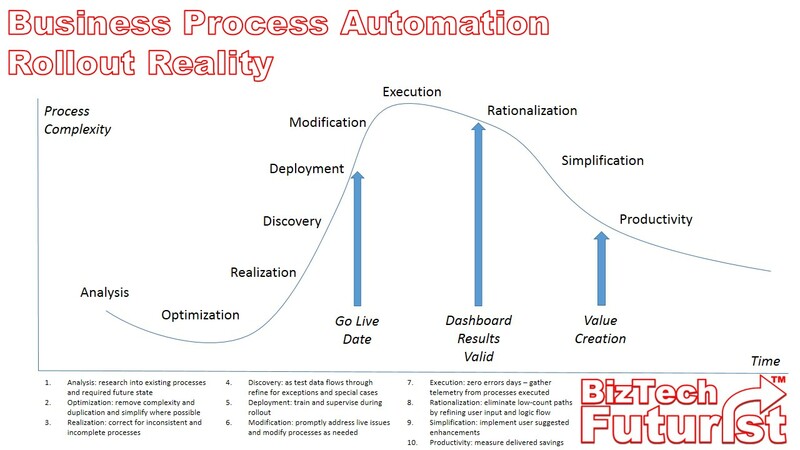 The old 80/20 rule of process automation applies here, only this time 80% will be unstructured and 20% will be standard which requires a different approach to BPM and possibly where the iBPMS, Case Management or IBO trends lend themselves more. Creating standard processes removes the ability to innovate because the goal for most is to seek and destroy variance in favor of the majority. And when an organization reaches the plateau of process improvement and has created volumes of standard processes which can be reused everywhere, what then ? We lose the ability to continually adapt and change. Jim wrote last year about Dark Processes, those which lurk around the enterprise conducted by many but defy definition. I suggested that many of these rather than be eradicated actually be exposed and encouraged because more often than not these are the ones that are getting the work done faster and more efficiently than strictly designed activities. But shock, they are not standard. I’m sure the analysts and purists will disagree, but when you standardize and make something conform to a norm you also lose the thing that made it unique and possible more innovative. There’s a tendency to rush into building standard processes without actually understanding everything as a whole, process improvement has become another silo in itself in the end. Building on your comment Theo, standard processes will only exist as long as they are better than the status quo, i.e. a means for an easy, straightforward upgrade from a messy, uninformed, unprepared process landscape. As soon as the process landscape is clarified this way, the organization can get really creative about how to continuously adapt and tweak. Standardized processes versus customization is a false alternative. Home construction, for example, can have a high degree of customization. The core processes and engineering techniques, though, are based on standards (such as weights, measures, sizes, and parts) and standardized processes (the sequencing of home construction tasks). Every piece of music, as another example, is completely customized. But music - whether pop or classical - follows certain norms; its construction follows standard patterns; the acquisition of skills follows standard techniques. The one difference between the examples I quoted versus 'standard processes' as currently practiced is that, in the examples above, customization is not only expected but welcomed - and in the case of music, demanded. The standards in those disciplines are designed to free up the participants from administrivia and minutiae. In standardization of business processes, standardization may end up becoming the main goal, at which point it morphs into meaningless bureaucracy and becomes as inflexible as the old ERP. This is the kind of standardization we don't need and shouldn't have. Standardized processes will go away when things like "the wheel" go away. Reason being: the standardized processes allow innovators to achieve higher and higher levels of value. Innovation is build upon standardized processes. Think of the computing power that is available now in your hand because of a standardized process for transmitting packets over diverse networks - you don't worry about that stuff any more - and now look at the ecosystem built atop it. I say that we need to standardize as many processes as possible. Get all of the non-value add stuff out of the way. Focus on value creation. Just like Jim's example - a vehicle transmission is a commodity part, but it enables the creation of huge amounts of value in the automobile industry. A standardized process is no different. Truly, it's the opposite question that I sometimes consider: is "ad hoc" simply a passing trend? Note that I'm not talking here about case management, which, while not as widely applicable as some would have us believe, still has a role to play and is likely to for some time. Rather, I'm referring to this idea that processes are just a name we give to a set of things that happen, presumably (but not necessarily) bound together only by a particular business goal or event. We keep hearing about these, and yet, my customers seem much more concerned about flexible but standardized processes that meet their need for reliable, consistent, and predictable results. Combine that natural desire with increasing pressure from regulators for compliant processes and the "anything can happen" approach naturally falls by the wayside. Actually it's customized processes that will slowly become extinct. Heavy customization of business processes is an anachronism in todays software market where users increasingly value speed, low cost and reduced risk over customized or bespoke capabilities. The question itself is an illusion. By "standard process" I believe Jim means a process that is fixed and does not change. The question becomes: how variable must processes be? The answer of course is dependent upon how variable the underlying work is. You can remove variability from work where you control every aspect of the work. For example, Henry Ford was able to turn the entire construction of an automobile into a 'standard process' by building a factory that had a place for every task that was associated with building that automobile. But only for exactly the aspects of the automobile that were actually assembled there. And everyone knows that all the cars were black because at that time he could not automate variable colors into the standard process -- but we can do that today, and more. You might notice that this is rather self-referential: you can have a "standard process" in whatever things you have complete control over; you need a flexible process in things that you have partial control over, and you need a completely dynamic process in things you have no control over. The question then becomes: will companies in the future continue to have control over anything? Even the most agile company has internal processes that coordinate work. When a bill payment arrives, there will always be a designated way to receive and record it. People will always have specializations, different titles, and there will always be internal process patterns which are agreed upon to handle things. There will always be internal work patterns under the control of the organization. To imply that "standard processes" might be going away would be another way of saying that companies are losing all work where they have control, and that is kind of silly. There are two trends: (1) controlled work is more automated and therefor less visible, so we think about it less, and (2) process technology is getting better at supporting emergent processes and that if the focus of our attention. So it appears like we are doing more and more variable processes, but that does not mean that the "standard processes" are any less important. Great insights here. Wonderful congruence with my experience. I always see it as a bell-curve with time along the x-axis and complexity-of-the-processes the y-axis. To begin with we assume we have fewer processes than we actually have but, as we dive into what actually happens in an organization we discover the exceptional and special processes individuals have created to deal with unusual and unexpected situations. Then as we automate our analysis deepens and we discover the inconsistencies and incompleteness of the processes and we add more unique paths to deal with those. As we roll out the automation and monitor the paths that are actually followed we begin see commonalities and find ways to merge processes. We also use the telemetry we gather about exceptions to walk back along the process path to try to eliminate the creation of exceptions in the first place. Steadily reducing the processes along the way. With experience and growing confidence in the system the users then start to suggest optimizations that will streamline their work and improve efficiency and now the once byzantine processes are simplified reducing the complexity once again. We rarely see this actually in action because we are too often blinded by the increasing number of processes that we add daily as we expand the footprint of our BPMS solution. But, taken in isolation, you will see the bell-curve effect on team or departmental level. What is required though is a willingness to allow organic change to the processes. A best practice I always encourage is to create, as the first piece of process automation, the Process Change Change Process. So that when users have an idea about a change it is captured, reviewed, approved (or rejected) and then implemented (or not). Tracking the metrics here where you can see the bell-curve in effect. There seems to be two aspects to this question, What kind of standardisation are we talking about inter or intra organisation. And secondly were standard processes ever the norm? Organisations talk about standardisation and are often looking for efficiency and consistency in their processes. You want consistency in the way that you manage processes, every department should onboard an employee in the same way, for example, pay invoices according to the same rules, request hardware and software in line with the same policies. That kind of standardisation is productive and makes the organisation easier to manage, audit and control. This intra organisational standard is desirable and advantageous. But is there is inter- organisational standards, I’m not so sure if this is as desirable. Inter organisational standardisation was surely the goal of ERM solutions, and although many aspired to this goal, the moment they opened the box of processes that were made available, they soon found that what was on offer didn’t quite fit their needs and tried to tweak or configure them. The biggest criticisms ERP systems were that they were inflexible when it came to configuring processes. It was never as easy as advertised and often left you with a white elephant that didn’t quite do what you needed however, the budget had run out. They were then difficult to upgrade and to support , but you couldn’t throw it away because of the huge investment. This is precisely why organisations moved to BPM solutions, these are designed to be built to be configurable and adaptable to future needs. Standardisation is therefore less the important, in my view, than the consistency and efficiency of those processes. And recent history has proved that this goal is far harder to achieve in practice for what negligible benefit it may bring. Then I read the responses and are we getting a bit confused? Of course there are many “non salient” processes that can be standardised such as payroll processes, payment processes etc. But where information is created and involving other users internal and external then change is inevitable to remain both efficient and competitive as circumstances and policies change. Some seem to think allowing change driven by the front line cannot deliver positive returns. This is not our experience over 10 years we have seen user driven changes result in class leading efficiency by some margin and by the way linked to the accolade from auditors as delivering best audit trail of activity. Indeed the ease and speed of change is significantly easier than imposing an external view on how to run your business. Once buyers understand how easy it is to use and deploy this BPM supporting “adaptive” software and quickly see significant benefits then the “salient” operational process will follow the dictum of need for such flexibility “why do it any other way” a real quote from a CEO and CFO! Not in the slightest. While BPM leaders move toward intelligent BPM, with a host of dynamic, collaborative and mobile features, smaller to mid-sized organizations, and those in industries who are new to BPM will continue to start their road to process improvement at the beginning, with straightforward, standard processes. BPM is far from its peak, and many companies are only beginning to understand what it means. Even businesses who are further along the BPM path have many, many manual processes still in place, and they are only automating a small percentage using BPM. So even for such businesses, standard BPM processes are a big improvement over their current manual, paper-based ones. 2) if we let each employee will do things their way without rules, the organization is in danger of losing control of their activity, as well as weaken its image and confidence among customers, in that they may offer different answers to the same stimulus. What must exist, is a process of governance above all others, that must collect variants, treat them and decide which implement timely.